Another Year of Listowel Races done and dusted; and it did not disappoint. As much as I love Ladies Day, if I had to pick a favourite, it would always have to be the Vintage Day. For the past three years, I have always come away from it glowing. The Judges this year were Orlagh Winters and Angela Wall, and they had a hard job. Every year, this event just grows and grows. People make such an enormous effort to take part, and the stories that you hear about every item of clothing that they're wearing never fail to wow me. I followed around the judges to take a few snaps of the reactions after these people got picked, and each one responded with a smile. I guess in a way that it is just the recognition of the effort that they made. After the judges approached one gentleman in a very dapper suit and asked would he take part, he responded with "I'd be honoured". It's really those kind of moments that melt your heart. 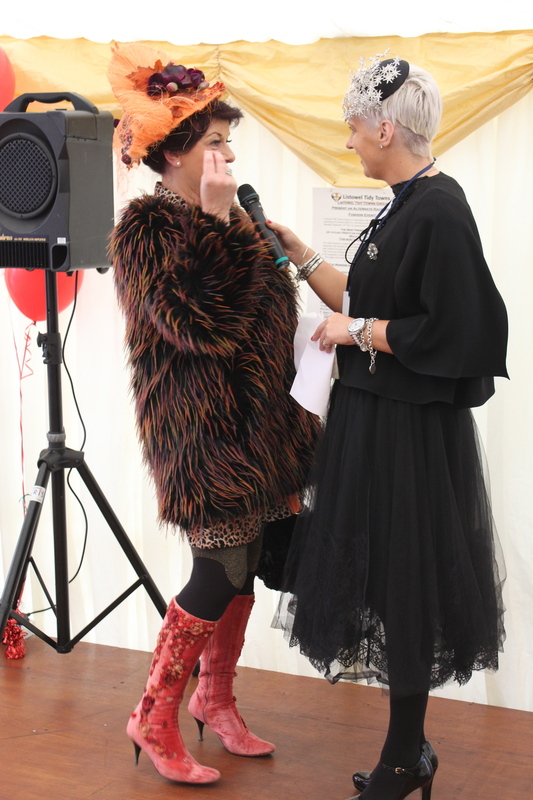 After all of our contestants had been rounded up, and after a couple of tv interviews, Orlagh started interviewing all of the contestants, and wow, the stories that were told. One woman was wearing a dress that she had worn forty years prior, and she even had the photograph attached. Aoife Hannon, a milliner who's hat had won best dressed the previous day, was in the most amazing ensemble, the most impressive item perhaps was a beautiful 70 year old hat that was perched on top of her head. People had made such an effort, almost every piece was at least 15 years old, and each piece had a history. Some stories just proved that you should never throw a good piece out, because you never know what you could do with it. Finally, the 10 finalists were chosen, five women and five men; and it was straight to the parade ring to announce the winners. The overall winner in the ladies category was Nora Kearns Moriarty, who received 200 sponsored by Listowel Race Company. Nora wore a soft purple printed tweed cloak and matching hat she purchased almost 30 years ago, with an eye-catching yellow dress she originally made for her daughter’s communion. She completed her outfit with jewellery she originally had worn when she was a finalist in Listowel Ladies Day in the mid 1980’s and a beautiful clutch bag, which was her mothers and contained a ticket inside from a vending machine dated 25th of April 1936! The first runner up was Breda Fitzgerald in an maxi dress and matching headpiece she purchased in a vintage store in New York. Breda received a Clarins Hamper worth €100, kindly sponsored by Oonagh of Broderick’s Pharmacy, Listowel. Then, the man who was simply honoured to be chosen, Jo Broderick, came first in the men's category. And boy did that man have character. Not only did he look incredibly dapper, but he was wearing a chain on his waistcoat that he had won in the Munster Championships over 60 years previous. You should have the heard the crowd when he was announced as the winner. Everyone simply erupted, and he stood there a little speechless. I think it made everyone's day. Paudi Moriarty was declared the first runner up, wearing a tie given to him by his late father and a very fashionable jacket from his older brother, and was awarded a Men’s Clarins Hamper by Oonagh of Broderick’s Pharmacy, Listowel. Congratulations to Listowel Tidy Town and An Taisce, and all their team, for organising such a wonderful event. Thank you to Orlagh Winters and Angela Wall for managing to choose all the winners, and for working so hard all day, to Orla Diffily, who put in a huge amount of work throughout the day. And an absolutely massive thank you to everyone who made such a huge effort to take part during the day; we can't wait to be even more impressed next year. I really loved watching the whole process, and I loved getting a chance to talk to all of these amazing people. In ways, the whole day was very humbling and is there really any better way to spend a Saturday?